Enjoy watermelon? So do coyotes, says Animal Services Wildlife Officer Gregory Randall. The city wildlife officer claimed the summertime fruit is a favorite coyote treat. That tidbit was among the facts, information and advice about coyotes Randall shared with Echo Park residents at last week’s meeting of the Echo Park Improvement Assn. Coyote sightings increase in the late summer when the adult predators train their litters to acquire food. The population, which fluctuates throughout the year, is also the highest at this time of year. 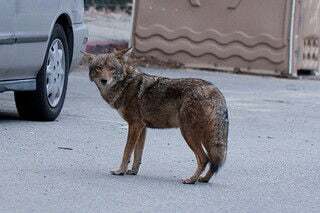 Echo Park, and the 90026 zip code, has one of the city’s largest coyote populations in the city. But Randall pointed out it was an estimate because there is no official count for coyotes in the Los Angeles area. The large number of coyote sightings in the Echo Park area coyote population is the result of several factors, including large sections of wooded hillsides and parks, a dense [human] population and, said Randall, the relatively large number of residents working from home. Officer Randall believes working from the home makes people more likely to notice the animals living in the neighborhood. In the past, numbers were exaggerated because animal control officers took reports of coyote at face value. Frightened homeowners often called in claiming packs of fifteen predators were in their backyards. But most coyotes are seen alone or in groups of three. The canines are also capable of traveling 20 miles in a day, which means a coyote spotted in Echo Park can be counted twice if it takes a trek through Silver Lake, he said. Coyotes, he said, are able to produce at least 11 distinct vocal patterns, which makes audio counts dubious at best. Fear also leads to overestimates of weight as well. He has heard reports of 200-pound coyotes, which is large for the species. The large number of coyotes makes the area more livable, he said, contrary to public opinion. The animals constitute an apex, or top ranking, predator and serve to keep the population of their prey in check. In Echo Park, that means fewer rats and mice. The co-founder of Citizens for Los Angeles Wildlife–CLAW–Skip Haynes said that if residents eradicate or displace coyotes, rodent populations boom, precipitating a greater nuisance. Treating the animals as pets leads to more problems. Randall said feeding the coyotes reduces their natural fear of humans and teaches the predators to feel more comfortable in urban environments, which boosts the chances of an encounter between urban wildlife and domestic pets. In addition to not feeding wild animals, which is a crime punishable by an $1,000 fine and/or six months in jail, Randall recommends home owners build fences at least six feet high, remove backyard brush where animals are able to hide and clear fallen fruit off the ground on a regular basis. Scaring coyotes away trains the animals, and their litters, to avoid humans, Randall said. What’s the best way to scare off a coyote? In the wild, for example, golden eagles flap their wings, making themselves appear much larger, to scare coyotes away. Randall demonstrated how to mimic the effect by opening and closing an umbrella. Loud noises–from air horns, whistles or cans filled with metal balls–also scare the predators away. “You can yell ‘Happy Birthday’ as long as you say it in a stern and clear voice,” the wildlife specialist said. If a resident of Los Angeles has a coyote or problem with other urban wildlife, Randall asked them to call (323) 255-WILD or to email him at Gregory.Randall@lacity.org. Tony Cella is a freelance reporter who has covered crime and grime in Los Angeles, New York City and the Kenai Peninsula, Alaska. Click here to contact Cella with questions, comments or concerns.